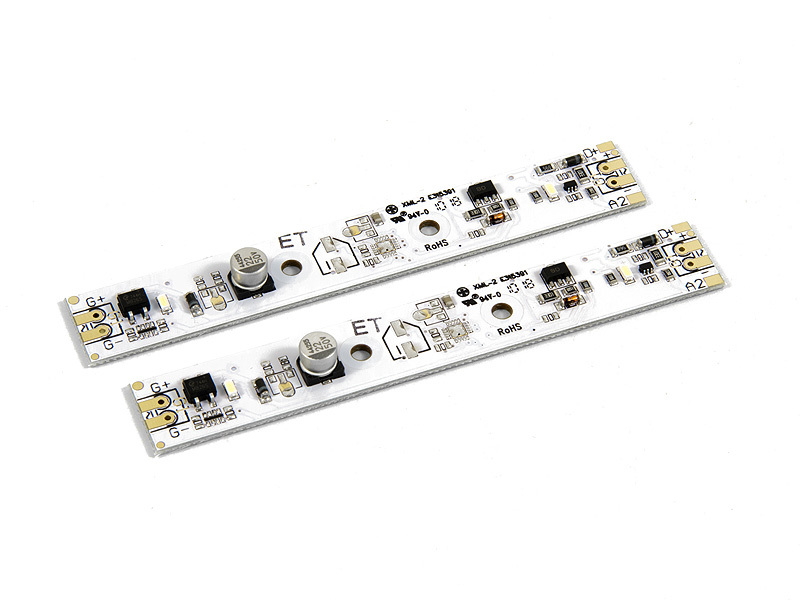 White-coated lighting board with 2 warm-white LEDs; works with AC (0-24V), DC (0-24V), and DCC (0-24V); long lasting and energy efficient (max. 25mAmps @ 24V). These boards are suitable for installation in almost all LGB® passenger cars. They may also be used for lighting buildings and structures around a layout. They can be mounted with screws in the roof of any passenger car that provides two properly spaced mounting holes, or mounted with double sided tape in the absence of properly spaced mounting holes. These boards maybe connected to either track power or a function output of a digital decoder. The lights come on at 4 volt and their brightness level remains constant from 9V on.